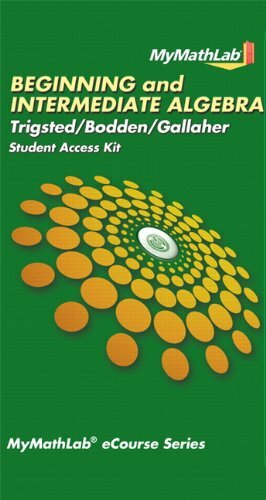 Beginning & Intermediate Algebra by Trigsted, Bodden, and Gallaher is the first online, completely “clickable” Beginning & Intermediate Algebra text to take full advantage of MyMathLab’s features and benefits. Kirk Trigsted saw marked improvements in student learning when he started teaching with MyMathLab, but he noticed that most students started their assignments by going directly to the MyMathLab homework exercises without consulting their textbook. This inspired Kirk to write a true eText, built within MyMathLab, to create a dynamic, seamless learning experience that would better meet the needs and expectations of his students. Completely clickable and fully integrated–the Trigsted eText is designed for today’s learners. The eText Reference is a spiral-bound, printed version of the eText that provides a place for students to do practice work and summarize key concepts from the online videos and animations. In addition to the benefits it provides students, the eText Reference also provides portability for those instructors that prefer a printed text for class preparation. The Guided Notebook is an interactive workbook that guides students through the course by asking them to write down key definitions and work through important examples for each section of the eText. This resource is available in a three-hole-punched, unbound format to provide the foundation for a personalized course notebook. Students can integrate their class notes and homework notes within the appropriate section of the Guided Notebook. Instructors can customize the Guided Notebook files found within MyMathLab. This is the MyMathLab Student Access Kit only, and does not include the supplementary materials listed above. Kevin Bodden is a professor of mathematics at Lewis & Clark Community College where he has taught since 1999. He holds a master’s degree in mathematics from Southern Illinois University at Edwardsville and a master’s degree in engineering from Purdue University. He has authored or co-authored ancillary material for numerous textbooks ranging from basic college math to calculus and statistics. He has contributed videos for several of these textbooks and has authored math content on grant projects for the Illinois Community College Board. Kevin is married with three children and is actively involved in their school and extracurricular activities. In his spare time, he enjoys soccer, camping, and geocaching. Randy Gallaher is a professor of mathematics at Lewis & Clark Community College, where he has taught since 1997. Prior to this position, Randy taught high school and middle school mathematics for five years in Missouri. He holds a master’s degree in mathematics from Southeast Missouri State University and has completed additional graduate coursework at both Missouri State University and the University of Illinois at Urbana-Champaign. He has coauthored ancillary materials for numerous math and statistics textbooks and has worked as a math author on several grant projects for the Illinois Community College Board. Randy is married with three children and spends most evenings actively involved in their activities. In his limited free time, he loves to fish the small rivers and streams of southern Missouri.